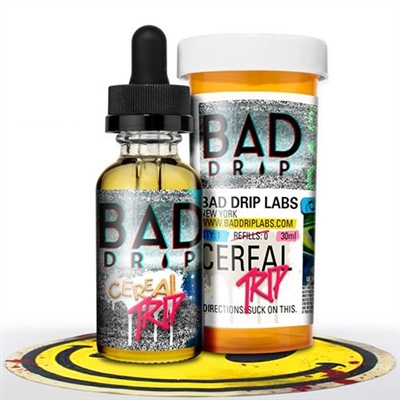 Bad Drip Cereal Trip E-Liquid is a delicious vape blend conceived from the tears of a clown and your Daddy's favorite fruity cereal, slathered on top of a gooey frosted donut, drowning in a sugar-rich milk bath. 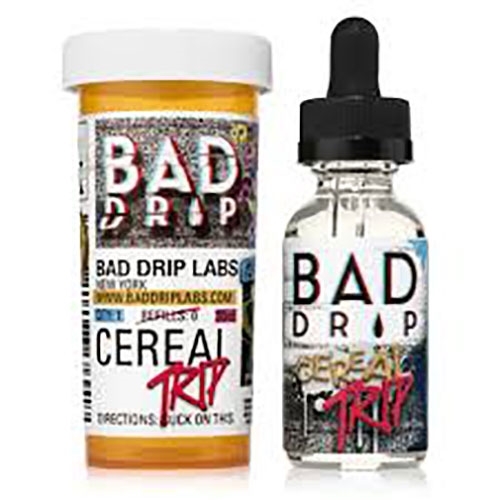 Marry pebbly fruity cereal, glazed donut, and rich, savory milk and you get Cereal Trip vape juice by Bad Drip. A sweet and tasty breakfast vapor that delivers a rich, full and satisfying flavor from inhale to exhale. This top selling premium E-liquid is masterfully crafted using only the finest ingredients. Try Cereal Trip and take your taste buds to their "Happy Place". I love Cereal Trip tastes like the best liquid cereal ever.